Oahu Beaches: map + list :: Best beaches in Oahu :: Hawaii. Honolulu. Waikiki. Oahu has over 100 beaches to choose from, including some of the best beaches in the world! With that many beaches, and just a week (or less!) on Oahu, how are you to decide which beaches to go to?! But first, here’s the quick list for easy reference! 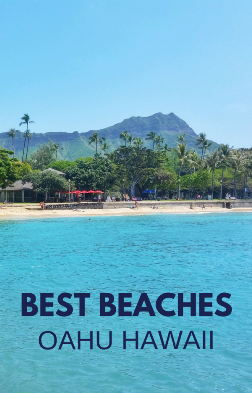 What are the best beaches on Oahu? And here is a list of beaches for snorkeling on Oahu. 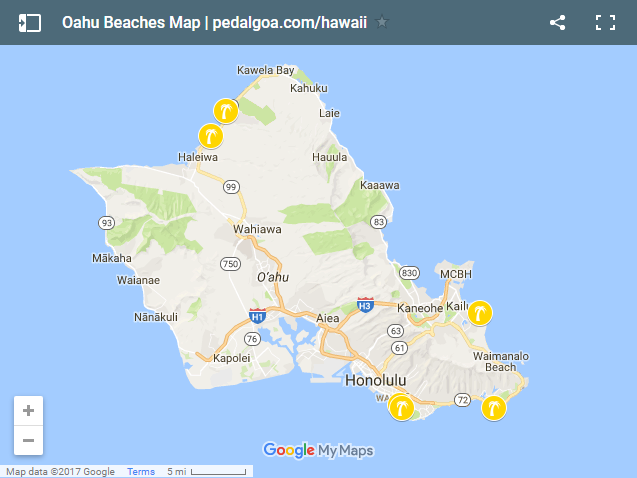 It’s an interactive map of Oahu beaches on Google Maps, so go ahead and click to explore! If you’re coming from mobile Pinterest, it will work better if you first open up this page in your web browser. Then click on the map! What are some of the best beaches in Oahu? 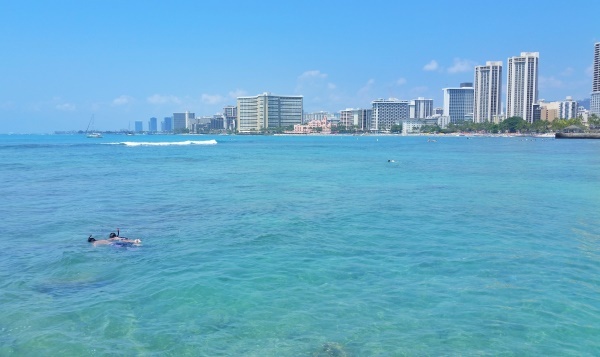 Waikiki is the area where you’ll find most of the island’s hotels and shopping, so naturally, the beach in Waikiki is among the most convenient for many. Waikiki Beach stretches about 2 miles, and it’s a public beach. 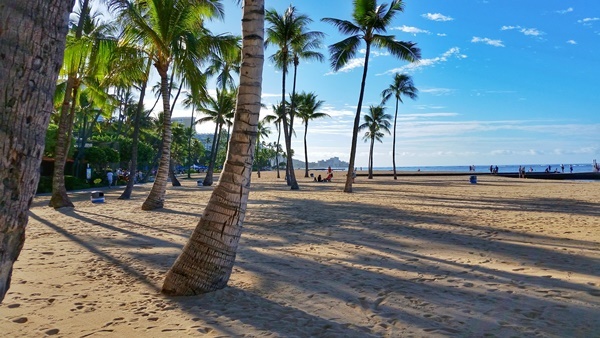 If you want to get away from the Waikiki crowds without completely getting away from Waikiki so you don’t have to deal with a rental car or bus, you might consider heading to Queens Beach. Depending on where in Waikiki you’re located, it’s a 15-20 minute walk to reach Kapiolani Park and Sans Souci park, where you’ll find Queens Beach. The park and the beach are named after Hawaiian royalty Queen Kapiolani. It would also be an easy bus ride too. The lifeguard stations are numbered and lettered, so walk until you come across lifeguard tower 2F. This is a good spot to set up for a picnic at Sans Souci Park, or set up for snorkeling at Queens Beach! You’ll likely find lots of fish swimming here, and if you’re lucky, you’ll spot a sea turtle too! Also look for crabs crawling on the pier. 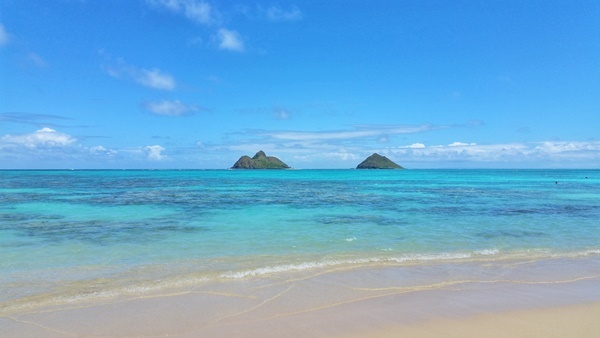 For another iconic view of Hawaii, you can head to Lanikai Beach to see the Mokulua Islands. The pristine beach of Lanikai has been named by TripAdvisor as one of the best beaches in the world. By car, it’s about a 30-40 minute drive from Waikiki. If you’re not planning to rent a car for your whole trip on Oahu, you can make a car rental worth it by also adding in a hike with the Lanikai Pillbox Hike that’s just nearby! The pillbox hike is about a 5-10 minute walk from Lanikai Beach. You can take a bus to Lanikai too, but outside of Waikiki and Honolulu, the bus just isn’t as frequent, so you’ll have to time it well so you’re not waiting a long time for the bus. It will also likely take at least 1 transfer to get to Lanikai from Waikiki by bus. For another place on Oahu that will make a single-day car rental worth it, you can head to the North Shore. Here you will find lots of worthy stops to find a full day of activities in the area. So make it a day trip to the North Shore from Waikiki! The North Shore is known as the place to go on Oahu for high surf during surfing season, which generally speaking, is during the winter months. When there’s high surf, these waves can coming crashing over the barrier at Shark’s Cove making for undesirable snorkeling conditions. 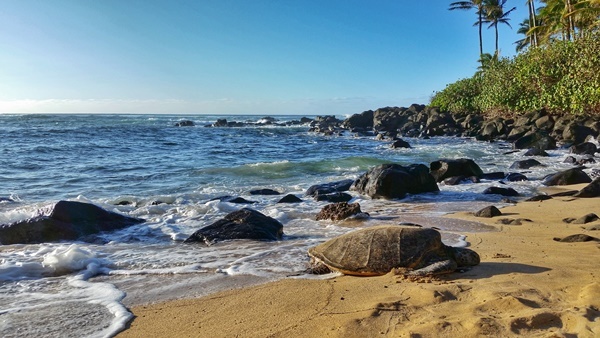 Sticking with the North Shore, you’ll definitely want to add Laniakea Beach to your list of places to visit when you’re on the North Shore if seeing turtles is on your bucket list of things to do on Oahu. Laniakea Beach is also called Turtle Beach, and it is one of the most reliable beaches for turtle sightings on Oahu. So if you’re looking for where to see turtles on Oahu, try this beach! This doesn’t mean that a turtle sighting is guaranteed when you go, as there are plenty of people who have gone to Laniakea Beach and not see a turtle, only to leave disappointed. At this beach, there are 3-4 of the same turtles who regularly come to the beach, and the evening before the sun goes down is a good time to catch at least one of them basking in the sun. There are volunteers here who make sure that everyone keeps their distance from the turtles to keep the turtles safe and well for years to come! 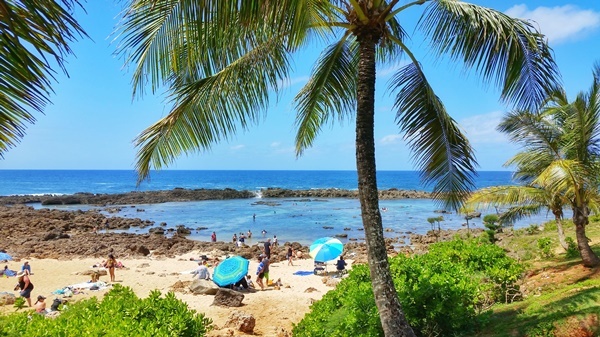 Waimea Bay is another North Shore beach you’ll pass on your way to Shark’s Cove and Laniakea Beach when you’re coming from Waikiki. Hanauma Bay is another place where you’ll find volunteers to protect marine life. Hanauma Bay is also one of the Marine Life Conservation Districts on Oahu. This means that special care is taken to protect the marine life here. Queens Beach and Sharks Cove are also a part of other Marine Life Conservation Districts. 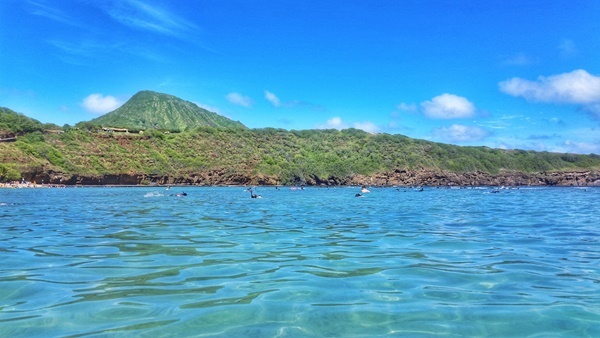 Hanauma Bay is also one of the most popular snorkeling spots on Oahu. This means that it’s even more important that everyone who visits does their part to keep ideal living conditions for the marine life who depend on the bay as their food source. There’s even a mandatory video that you need to watch before you enter the waters of Hanauma Bay. This is so that you can help to keep the coral reefs of Hanauma Bay healthy and long lasting. Preserving the coral reefs will help to keep those colorful tropical fish in the bay for years to come too! Hanauma Bay is an easy bus ride from Waikiki, or if you drive, the Koko Head hike would be a perfect hike to do before you start your snorkeling! Koko Head is located pretty much right in front of Hanauma Bay. Well, for a bit of a taste of that Hawaiian culture, you don’t even need to leave Waikiki! Several times a week, there is a free hula show with a display of Hawaiian dance and music in the heart of Waikiki at Kuhio Beach. 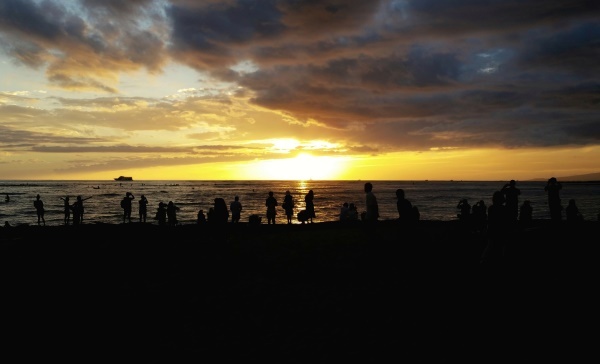 It’s the perfect opportunity to enjoy the views of the sunset on the beach while waiting for the hula show to begin. Just before the cultural show begins, there’s also the lighting of the torches and blowing of a conch shell. Things to maybe pack for your trip to Hawaii! Now, here are some things that you just may want to add to your Hawaii packing list for beach trips and more! These types of beach shoes so you don’t have to worry about hidden rocks under the sand! These packing cubes so you can find the stuff in your suitcase easily once you land in Hawaii so you waste no time getting out and about!